On a clear day in downtown Milan you can see the Alps rising in the distance. Thirty miles north of Milan at Malpensa Airport majestic mountains are even closer, they rise as a backdrop. Flying in and out of Malpensa, you can see glaciers in these craggy peaks. Yet much of the area south of these mountains towards Milan is almost as flat as The Netherlands or Louisiana. The Po River is the largest of several rivers flowing south from the mountains to the Adriatic. While many of the levees along the Po may have been recently built, this area has a more than a thousand year history of damming, channeling, and canalizing these rivers. My buddy Lyman and I had chosen Milan because it was a a place we could fly to for free on airline miles and take a week long bike ride. We landed at seven on a Sunday morning. 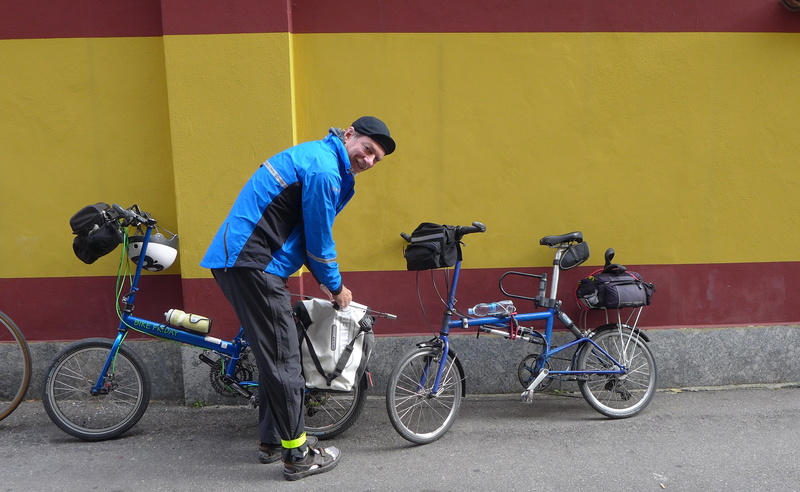 We both had folding bicycles that fit in a suitcase. 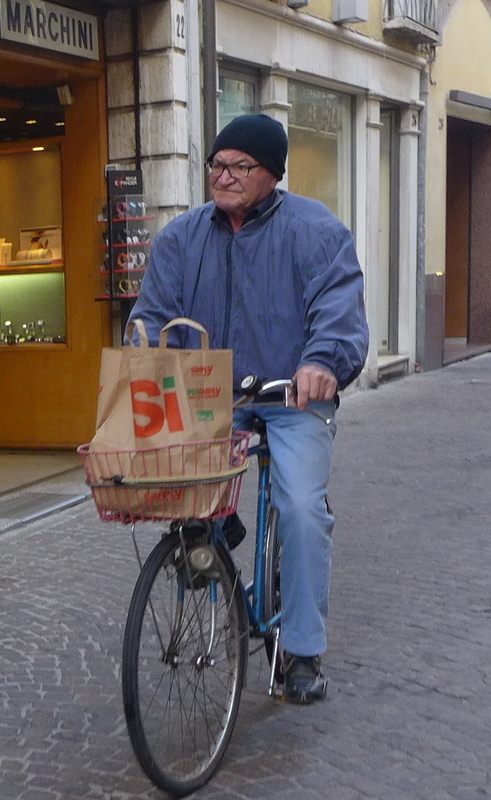 We put our bicycles together, checked the suitcases at a place in the airport, and headed off into Italy. All over the world there are rarely well labelled instructions on how to leave an airport by bicycle; Milan Malpensa was no exception. We at first found ourselves on some kind of freeway. We found a way off that busy road. We followed Google Maps, looking for a supposed bike path along a canal. We passed through a small village on a road that transitioned from Paved Road to Unpaved Road to Grown Over Path Though the Woods. 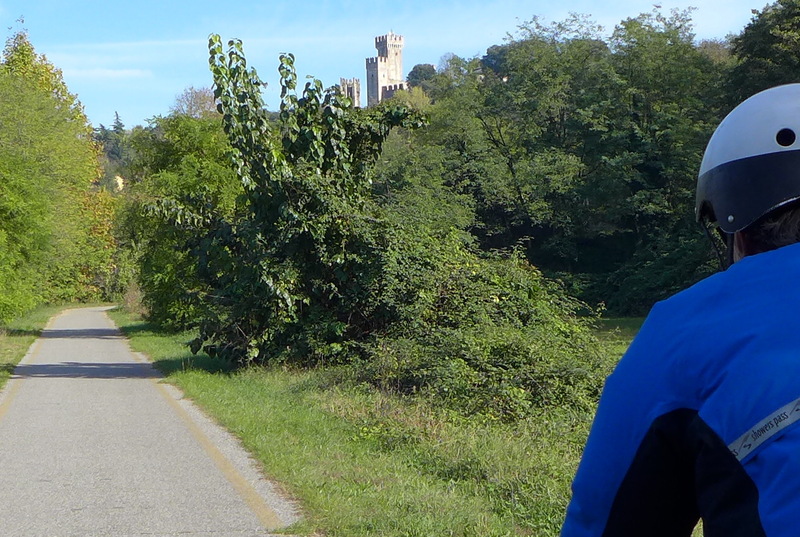 We had to trust Google, and the path eventually put us on a delightful paved bike path that parallels the Ticino River. This heads south for about twenty miles. 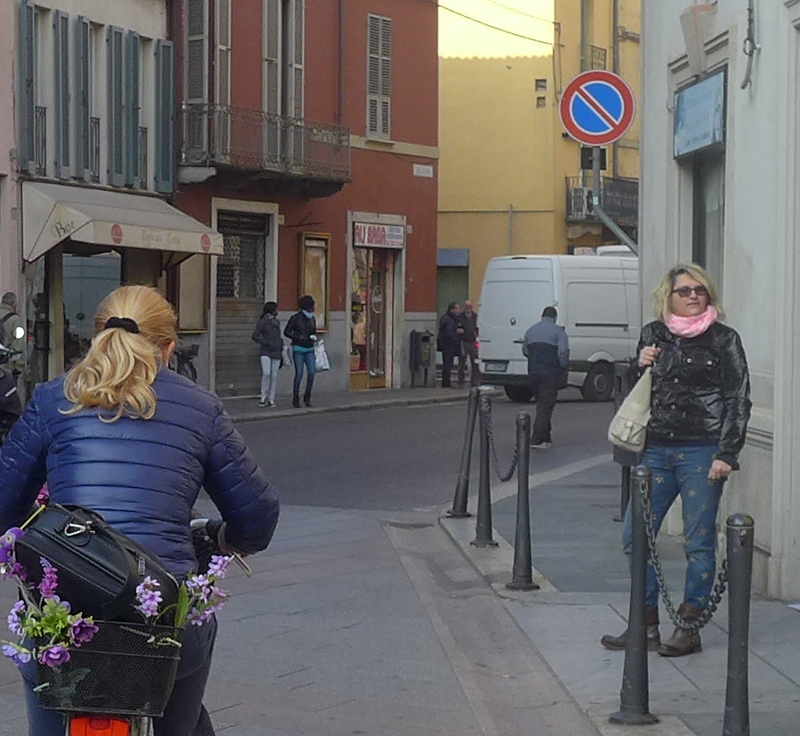 If you turn left slightly at a canal intersection, you can follow another razor straight canal bikepath that deposits you right into the trendy Naviglio neighborhood of downtown Milan. That is only a mile or so from the historic center with the enormous cathedral Duomo. 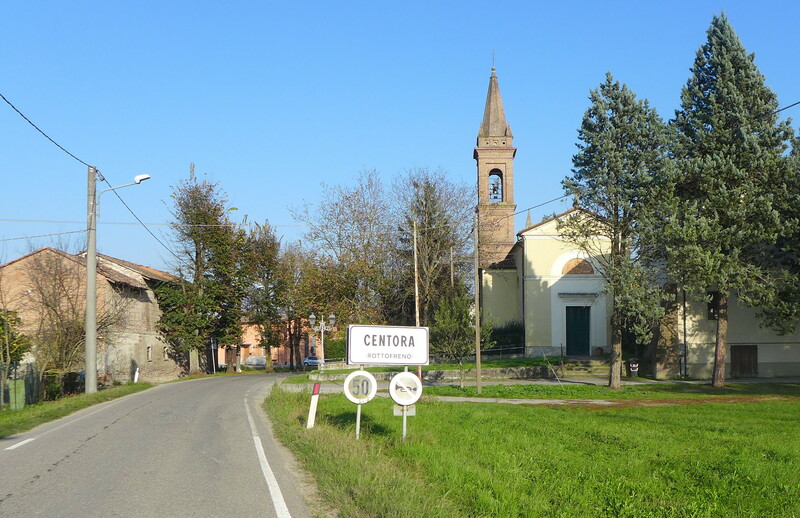 We stayed one night in Milan, and headed out the next day along a canal, south towards Pavia. We had to cross the Po River on a dangerous narrow bridge filled with traffic. 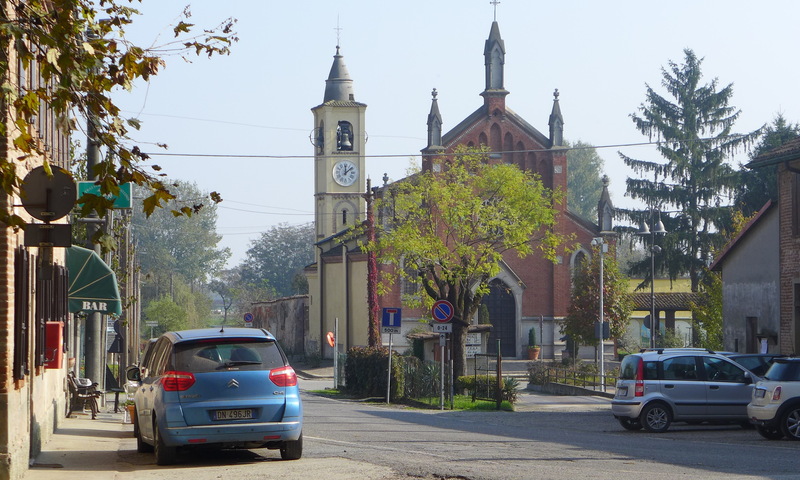 For the next six days we slept each night in a series of small cities that line the Po River. 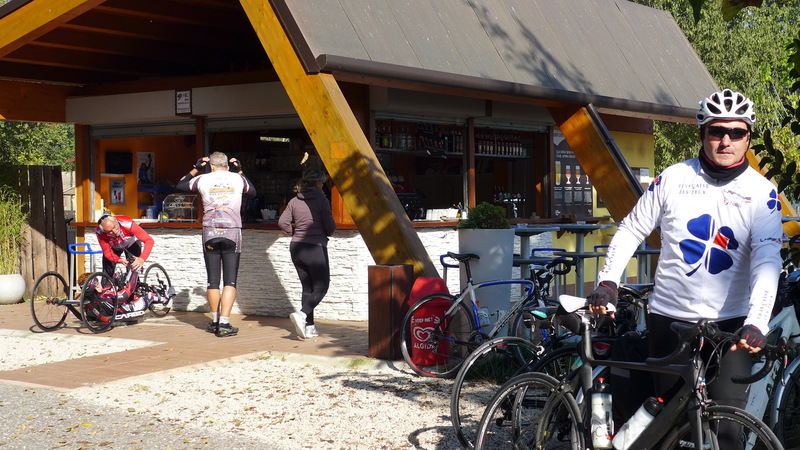 We then turned north and rode to Sirmione on the large Alpine lake Lago di Garda, before biking back towards Milan and taking the train the rest of the way back to the airport. 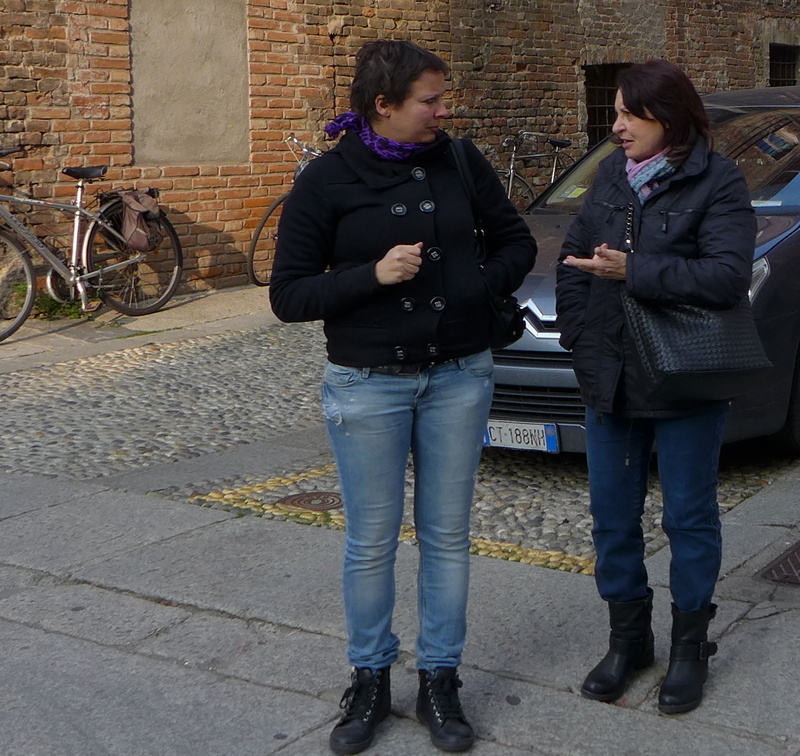 Pavia. Piacenza. 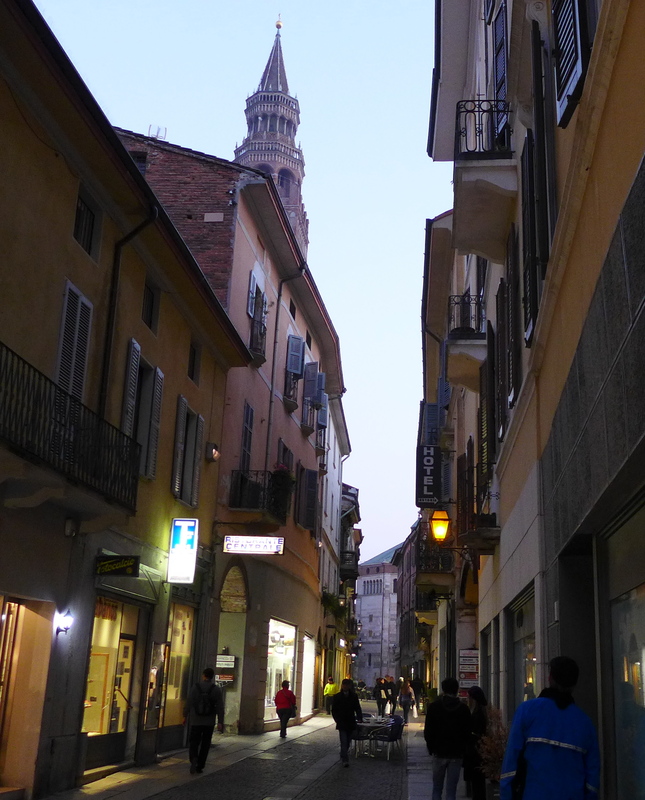 Cremona. Sabbioneta. Mantua. 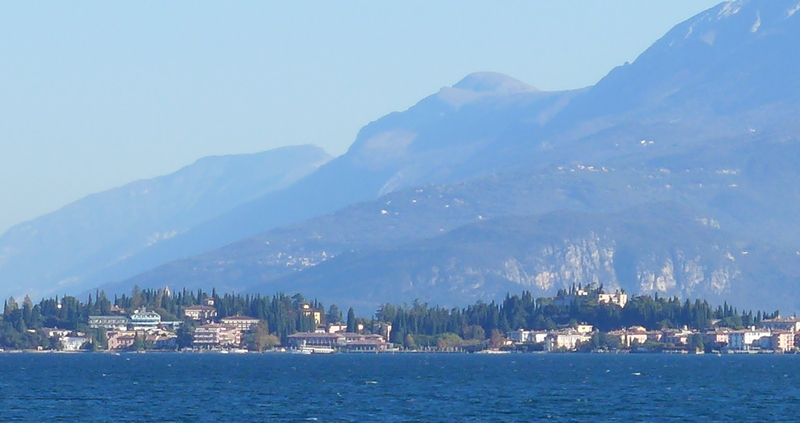 Sirmione. Except for Mantua, I had not heard of any of these cities previously. Yet any one would by itself fill a week’s worth of exploration into art, history, and architecture. Architecturally, each offers a more thorough urban experience than much larger cities in America, like say, Atlanta. Each has its own unique history, culture, and cuisine that goes back thousands of years. 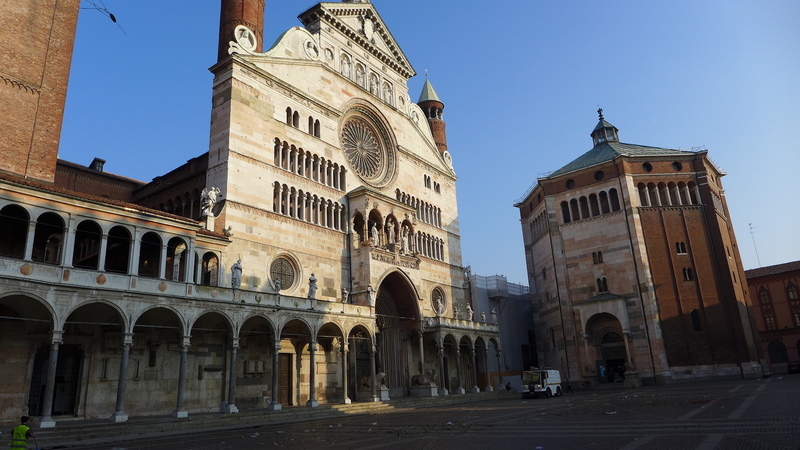 Although these small cities are less than fifty miles apart, Pavia, Piacenza, Cremona, and Mantua each has a unique cathedral, built somewhere between the year 1000 and the year 1400, filled with Renaissance art. Building on the right is the Palazzo Ducale in Mantua, 500 rooms, home of the Gonzaga family from 1328 to 1707, when Mantua was sacked by the Hapsburgs. We had not really planned this trip much in advance. I did not even realize that this area south of Milan would be so pleasantly flat, or contain so many bike paths. 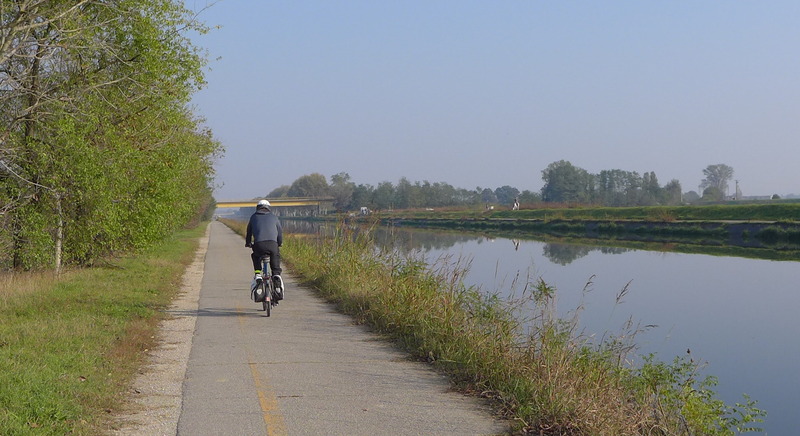 But especially from Cremona to Sabbioneta to Mantua to Sirmione, one can travel all day on lovely bike paths that top the levees containing the Po River. 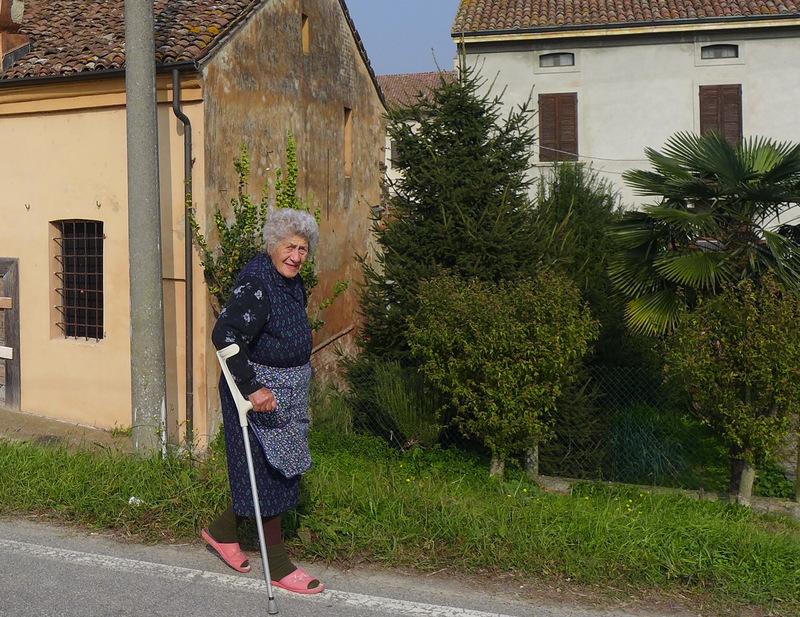 Finding your way is not always easy; bicycling in Italy is not like Holland; bike paths stop and start, and sometimes dump you on a busy highway or narrow bridge. One has to constantly look at the map. This was the first European trip that I had been able to get my smartphone to work correctly, it helped tremendously. As expected, food was wonderful. In America (and much of northern Europe) there are a fair sprinkling of pretty good places to eat, but you cannot depend on circumstance. In America, you have to ask, and look, for places with good food. In Italy, as in Spain, France, and Portugal, there is a tradition of excellence, and one can just stumble onto wonderful food. For lunch we normally just rode up to these places, in tiny towns, with barely a sign. Some seemed filled completely with just men; truck drivers and farm workers eating like kings. We had great linguine with clams at this truck stop along the bike path. There were alway lots of interesting people to look at. 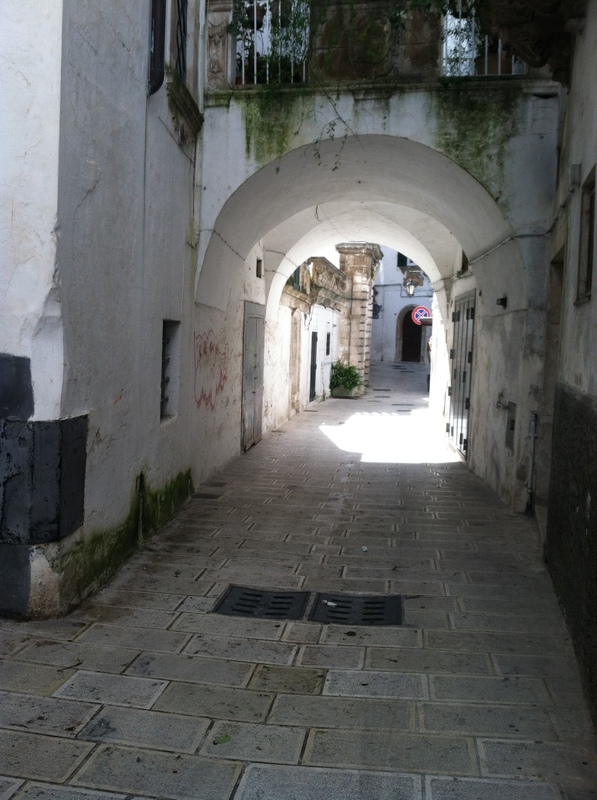 Puglia is the heel of the boot of Italy. It is relatively flat. Other than the weather, everything on this weeklong trip was great. The weather was mostly cloudly, intermittent rain, windy, daytime highs in the low sixties. But what variety, so many things to see! 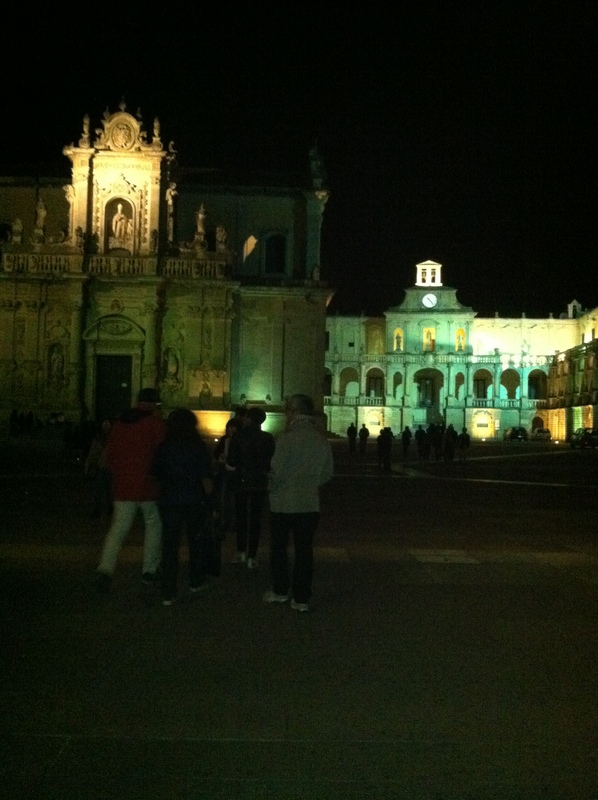 In one small portion of one region of Italy, I biked a circuitous route from Bari to Lecce and back in one week. This route showed tremendous variety of both cultures and physical landscape. The airplane ride over was fine, but the interior of the American Airlines 767 from New York to Rome looked something like a third world bus, filled with what seemed tour groups. Pieces of the plastic molding on the ceiling were coming apart, everything was dirty and worn. I connected in Rome with Alitalia to Bari airport. 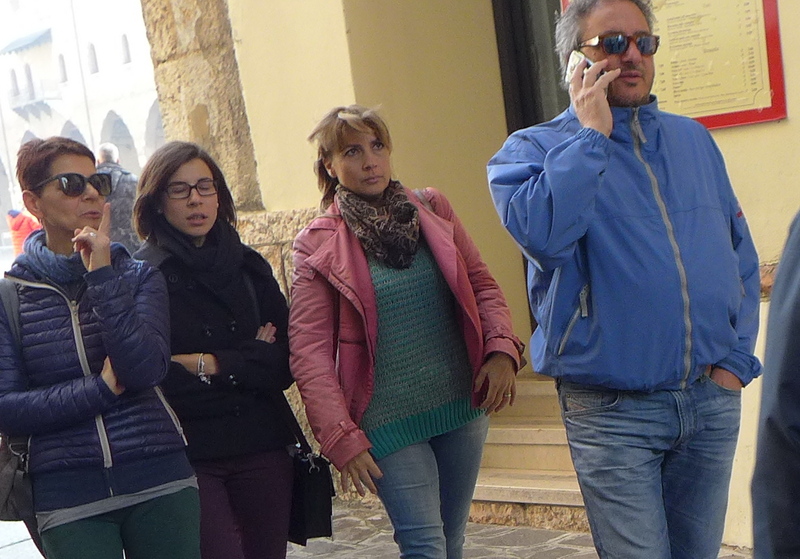 As the airport bus pulled into the downtown Bari train station, it had to stop abruptly because two young women pedestrians were crossing the street. They smiled at the bus driver, then intentionally took their time in getting out of the way, as if flirting with him. 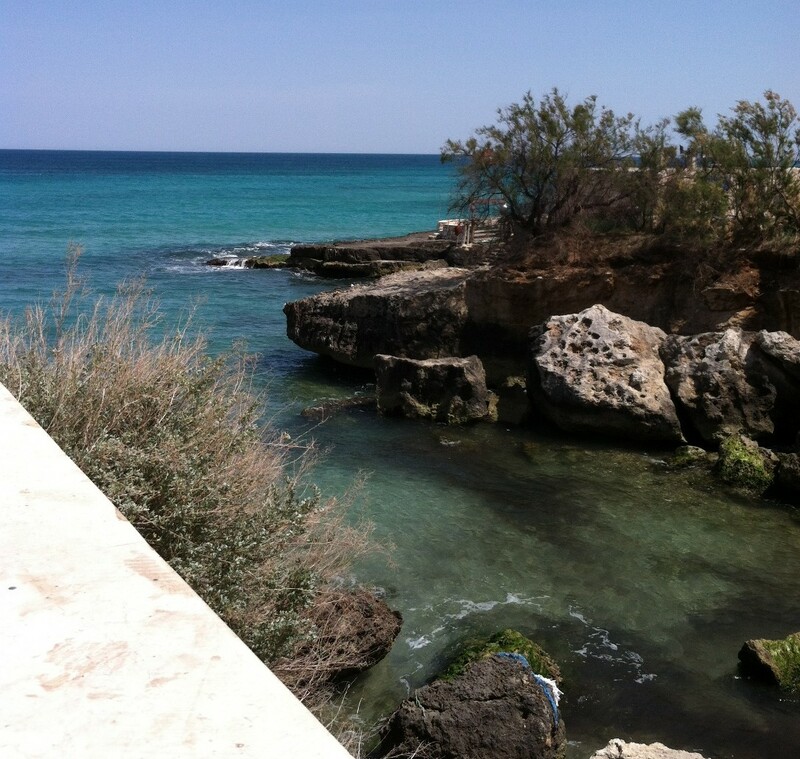 This genial and relaxed attitude prevailed in much of Puglia. 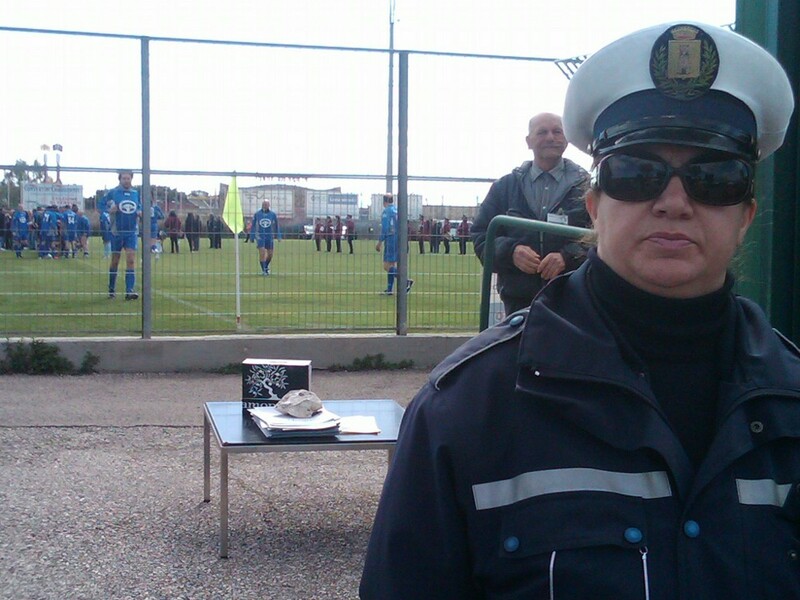 I stayed in Bari two nights, one on arriving Italy and one on departing back to America. 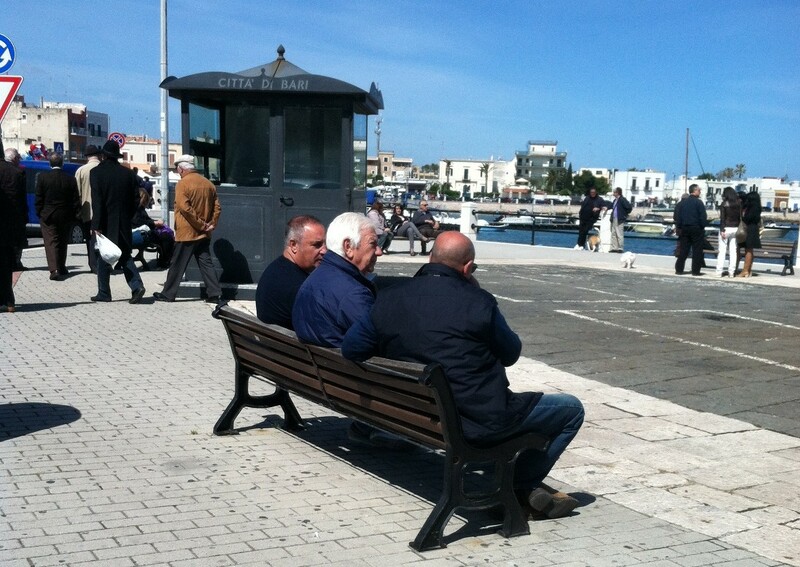 Bari is a port city, full of the clichés about port cities. There is graffiti everywhere. It is dirty. It is relatively poor. Yet for an American the street life was amazingly vibrant. It seemed like everyone in the town, young and old, comes out on the street from six to nine in the evening, just to be out on the street. The downtown shopping district had the usual chain stores like Bennetton. People milled about. 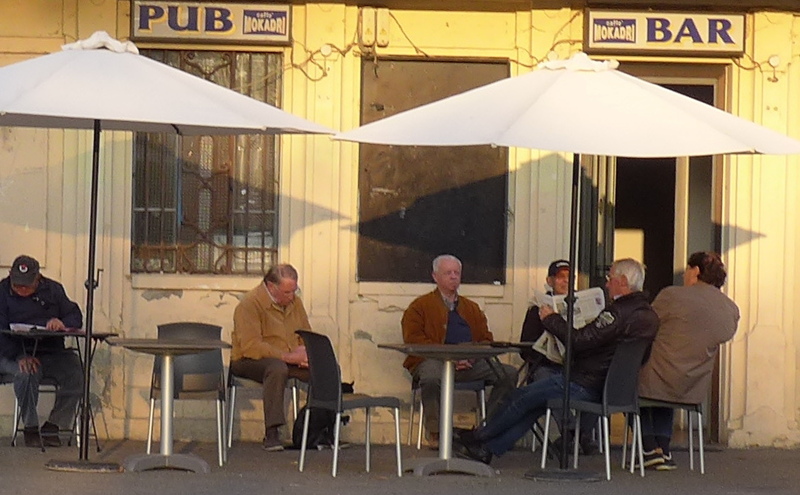 Even by European standards, people in cafes seemed to be eating or drinking nothing at all, just lingering over a coffee purchased long ago. 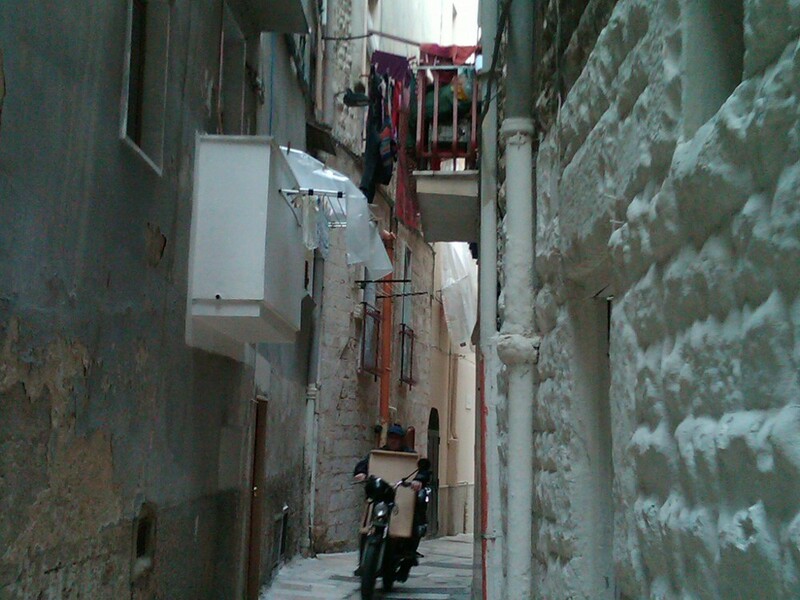 Most of Bari has the wide street grid like we think of Paris. In the historic thousand year old core of Bari, in what the Italians call a Centro Storico, streets abruptly become sidewalk size, meandering in strange angles between medieval buildings built right up to the street. My guidebook says that until recently it was considered dangerous to walk in this area at night. Where the Centro Storico ends on the harbor, bars and restaurants spill out onto the plaza looking over the square and the water. Young people milled about, many with Peter Anderson haircuts, hair greased and swooped in all directions. This was a much more edgy vibe than the tourist safe, aristocratic feel that I sensed three days later in Lecce. 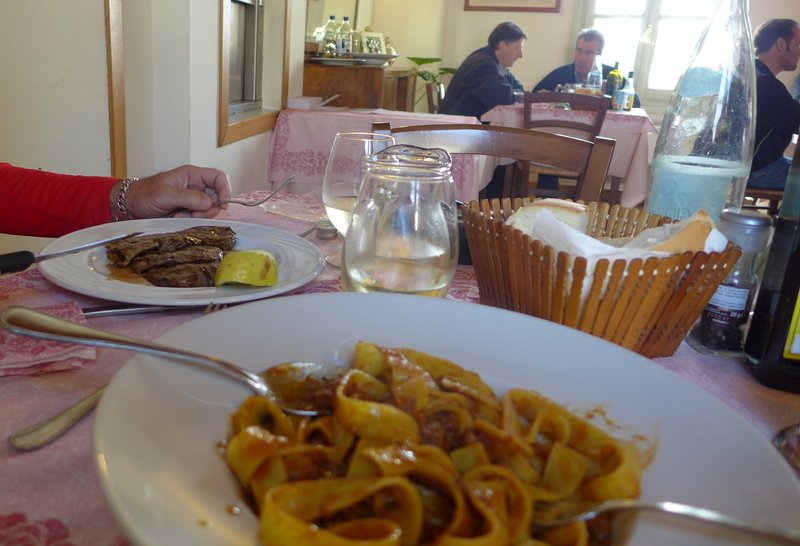 Restaurants in Puglia do not even unlock their doors for dinner until seven or seven thirty, and no one eats until about nine. Because of my jet lag, I could not wait for nine o’clock. In a doorway on a very narrow street in the Centro Storico a woman was frying these 2 x 2 inch squares, sold five for a Euro in a white paper bag sprinkled with salt. Tasting what I purchased, I found them to be essentially breaded fried polenta squares, or grits. I walked around munching on these delicious things, trying to find somewhere else to eat. My dinner that first night ended up being two glasses of white wine at a sidewalk café, mixed with platefuls of tapas like appetizers, mostly olives and cheese, served to me by what looked like the daughter of the owner. 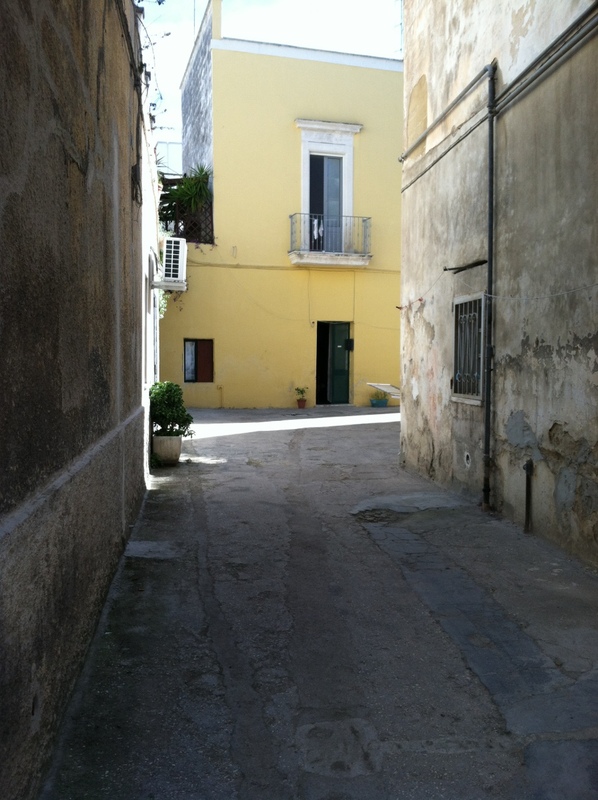 My first day of bike riding was to Matera, about fifty miles south of Bari. 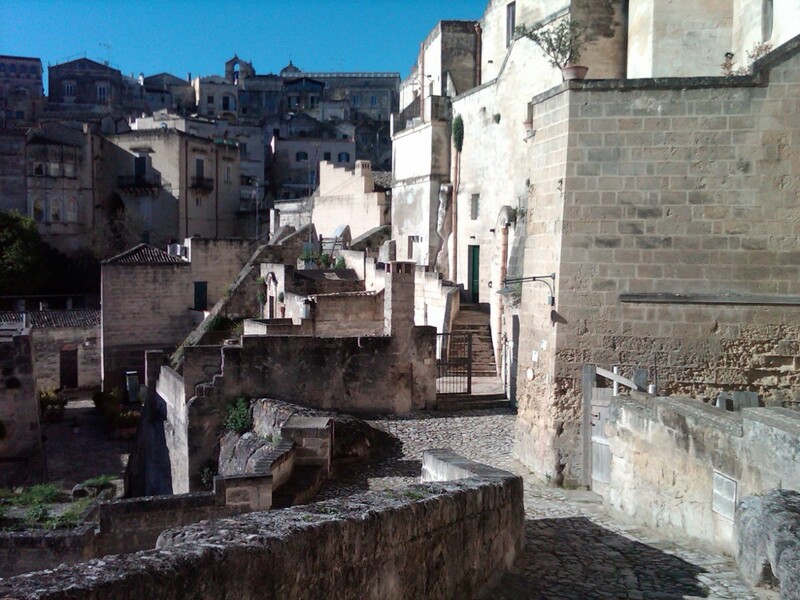 The oldest part of Matera is called the Sassi de Matera. The city is on a cliff, falling into a steep gorge. 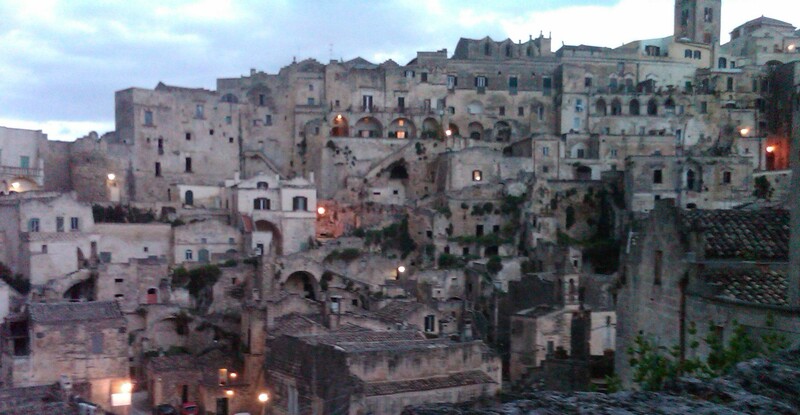 From a distance it looks somewhat like a typical Italian hill town, but most of the Sassi buildings are really caves, drilled into the soft local rock. People have lived in these cave dwellings for really, thousands of years. My guidebook says that there are over sixty cavelike churches in Matera. As recently as about 1950, people here were living in stacked cave homes, frequently with farm animals, with an average of six children per family, and a fifty percent infant mortality rate. The Italian government in the fifties built high rise housing projects on the outskirts of town, and most people moved out of the Sassi. 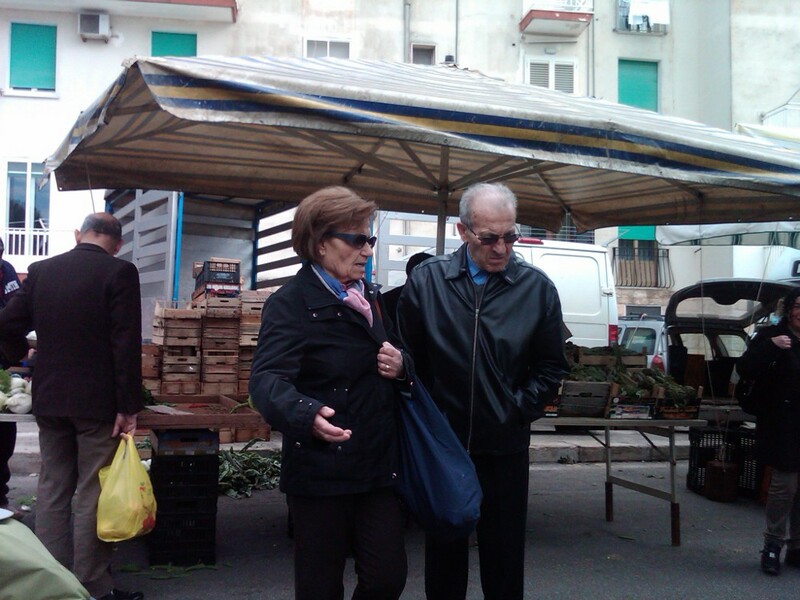 Now the Sassi has become a tourist attraction, and artist types are moving in. My hotel, owned by a Brazilian, set me up in a tiny stone space with a ladder up to the sleeping portion, and very modern bathroom fixtures, carved out of a former cave church. The next day I rode across rolling plains. Towns in Puglia from a distance look like big cities, since almost no one seems to live in the country, and towns abruptly start with six/seven story apartment buildings pressed close together. 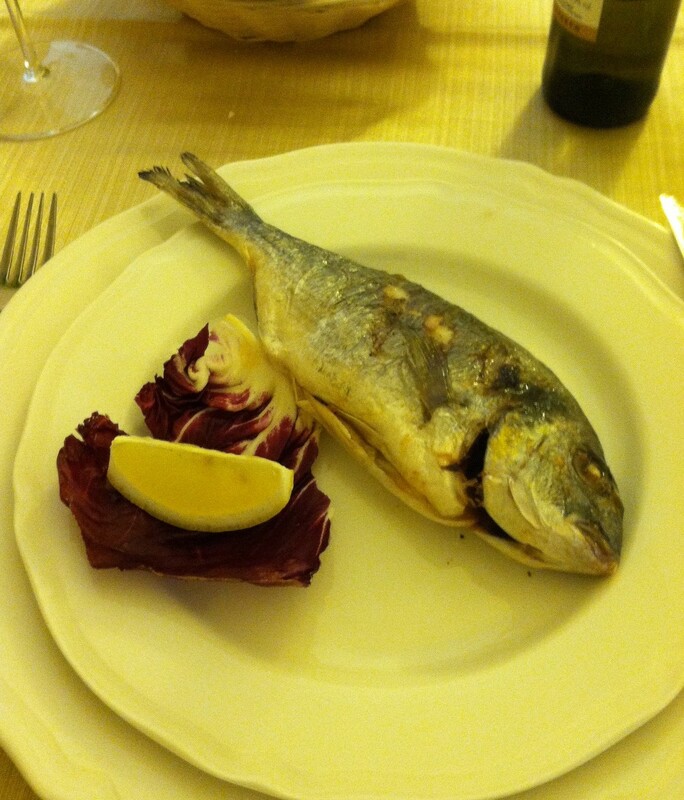 Lunch that day was on a Styrofoam plate, in a town called Gioia. 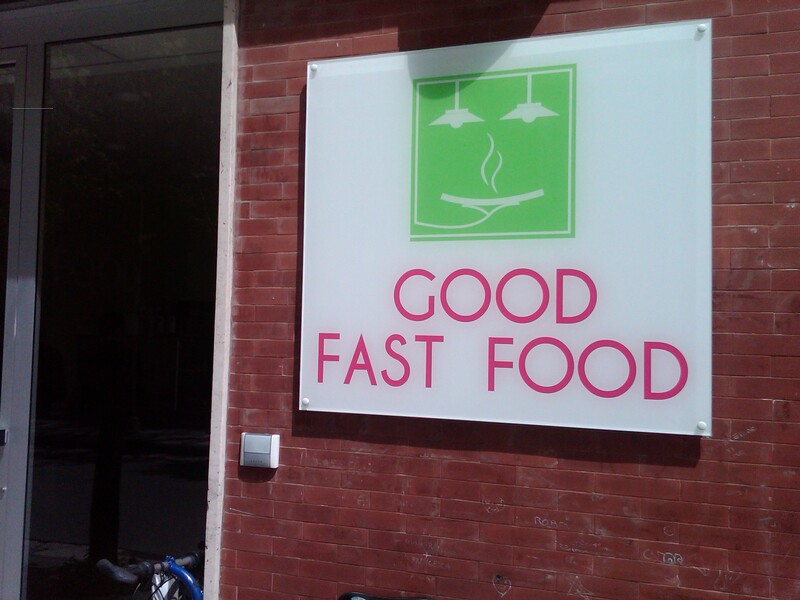 There I finally found the Good Fast Food I had been looking for since my arrival. These were vegetable dishes cooked in a Puglian way. 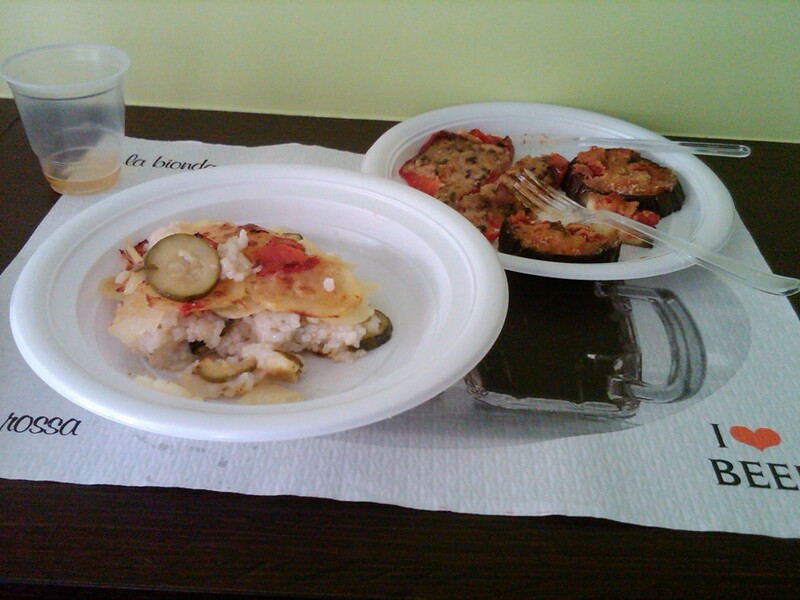 The main casserole was made with rice, potatoes, zucchini, and mussels. The stuffed peppers and eggplant were even better. As I said, the terrain here changes quickly. I was leaving my previous region of rolling plains and passing into a rockier region called the Valle D’itria. The farmland now was cut up into small rocky plots, divided by stone walls. The distinctive houses of this region, with conelike stone roofs, are called trulli. 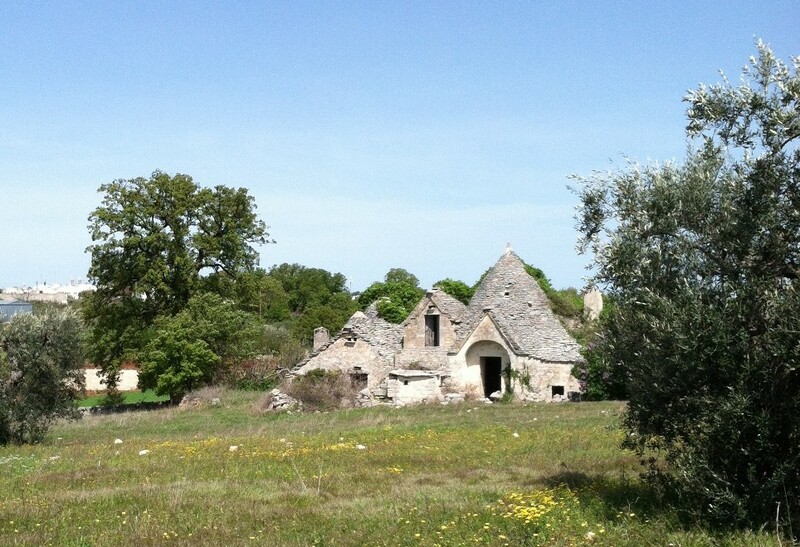 Most trulli now seem to be either abandoned, used as a toolshed or guesthouse, or converted into second homes for British vacationers. The style has also been appropriated for much larger vacation homes as well. 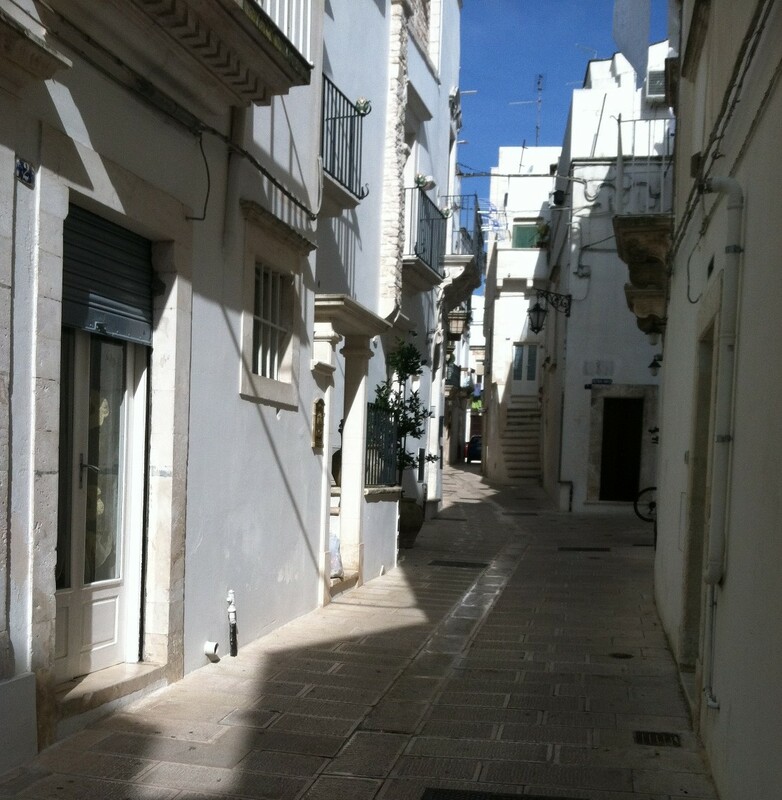 I stayed that night in Locorotondo, which has a Centro Storico of all white. You have to be careful walking around because you become completely lost in this maze of streets. Saturday dawned early with strong winds and cold temperatures. 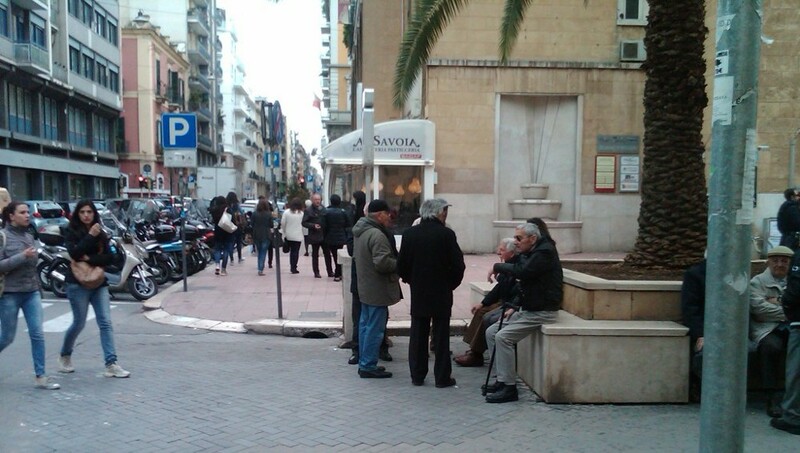 The Puglians in April still wear winter coats. Fortunately, the wind was blowing in my direction. I stopped at a great farmer’s market on the way south. In many ways, it was not that different from the one in Carrboro, which is also on a Saturday morning. 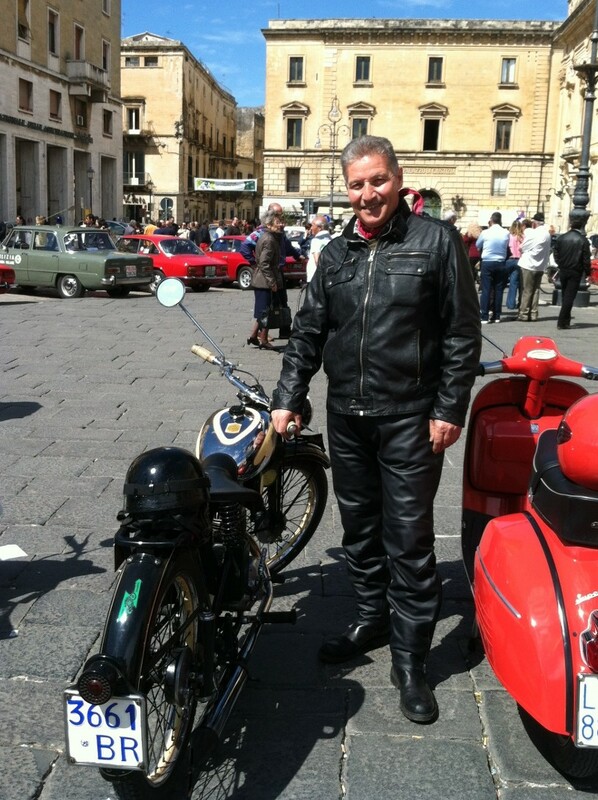 This day the wind helped me find the gumption to ride all the way to Lecce, a distance of more than sixty miles. 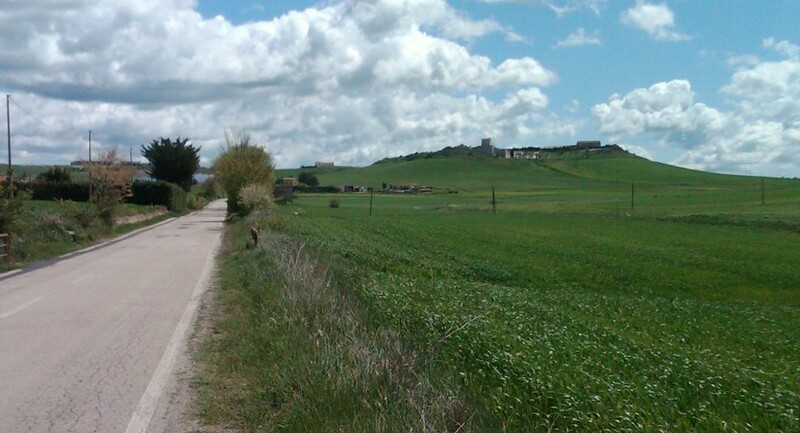 This one day, by bicycle, took me from the rolling plains near Matera to the rocky plots divided by stone walls of the Valle D’itria, to the flat plains of the Salentine Peninsula. I had passed all the way through the region with the Trulli houses. The roads here must be the only flat straight roads in Italy. I went on two stretches between towns at ten miles each, arrow straight, with not much traffic. This does inspire people to drive fast. While most drive very small cars, the SUV owner types of Italy drive big Audis and BMWs. A big Audi roared by me at what must have been eighty miles an hour, coming what seemed to be about six inches away. That freaked me out for much of the day. 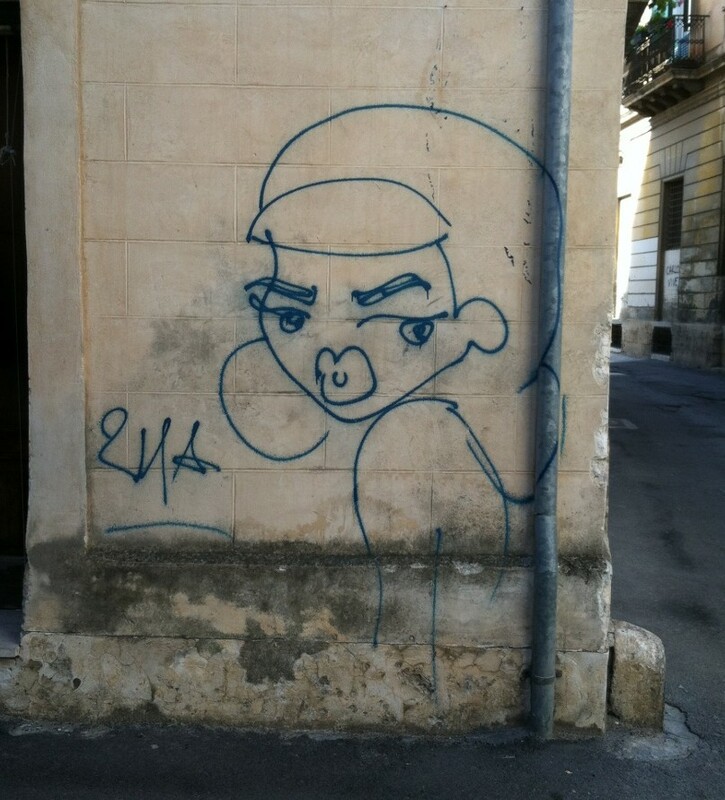 Lecce has spent time and money promoting itself as an artistic center, and I saw many galleries and other places where painting and sculpture were in process. However, all the music I heard was American or British. Even the Saturday evening art walk was centered around playing American jazz. In the streets there was lots of classic rock, Queen and Led Zeppelin. Sunday morning there was an amateur old car show in one of the piazzas. Interesting old Fiats and Alfas, just like the ones in the Sicily scenes in The Godfather. This guy was showing his antique motorcycle. 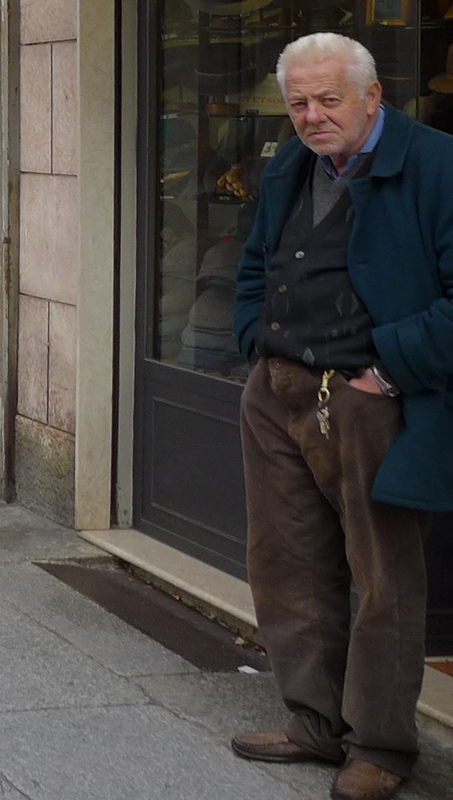 Italians dress for the occasion or the profession. If you are biking, you dress in bike clothes. Motorcyling; motorcycle clothes. Waiters and sales clerks all seemed to take special care to dress the part. 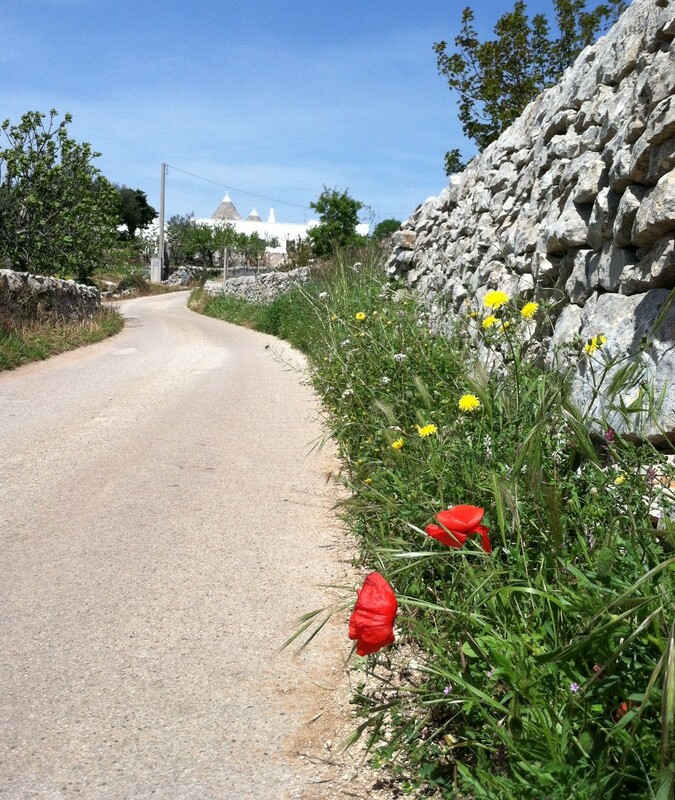 Monday morning I headed back towards the Valle D’itria; this time in the direction of the town of Martina Franca. 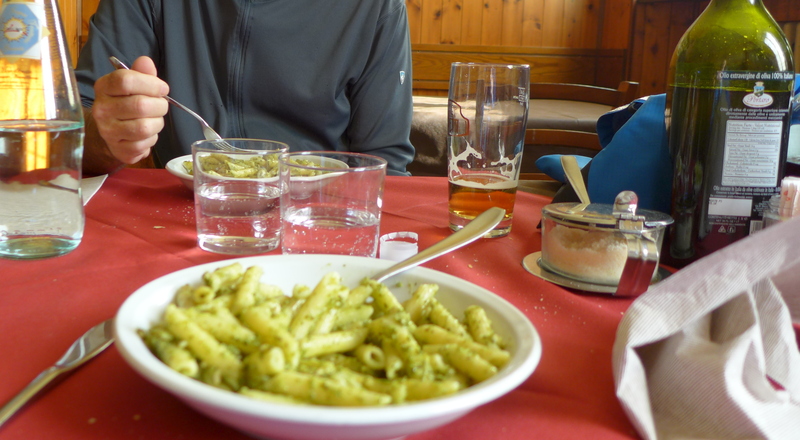 Lunch that day was in Francavilla, a flat seemingly working class town on the plains. This must have been the fanciest restaurant in town. 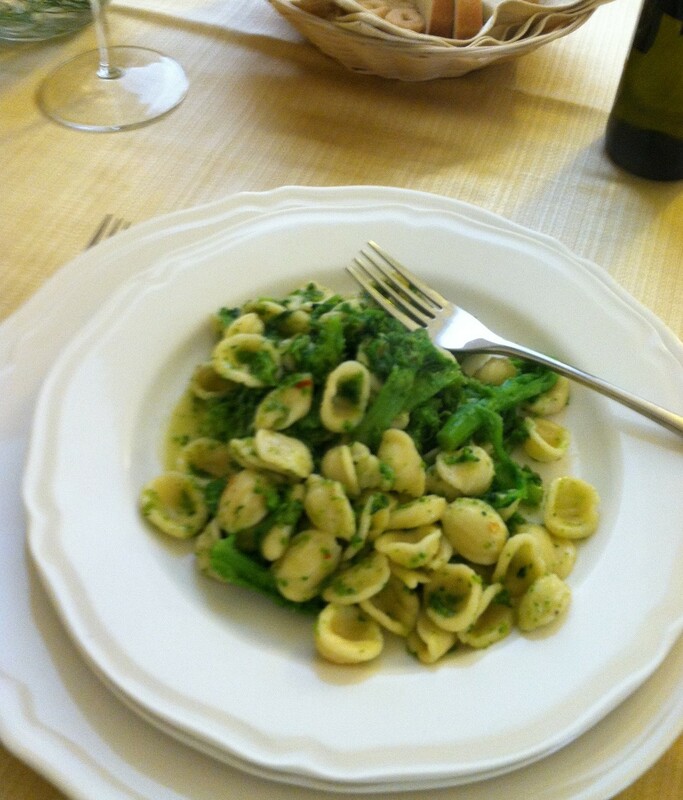 I had been looking forward to orecchiette con cime de rapa (orecchiette pasta with broccoli rabe) which is a Puglian specialty. I tasted amazing, even though it really was just broccoli rabe and pasta, no apparent cream or butter, not even much oil. I think they must have sautéed it in anchovies or something. I was the only customer until later in the meal, when two guys in suits came in. The waiter then turned on loud music, the Bee Gees. Second course was fish, followed by a stiff expresso. Just when I was comfortable in the boring flat plains, expecting the next town on the map to look like the previous, the town of Oria approached. It sits on a cliff overlooking the Salentine plains, where the rocky hills of the Valle D’itria begin. God must sit overlooking those plains, because there is a cathedral in that town, at the highest point. 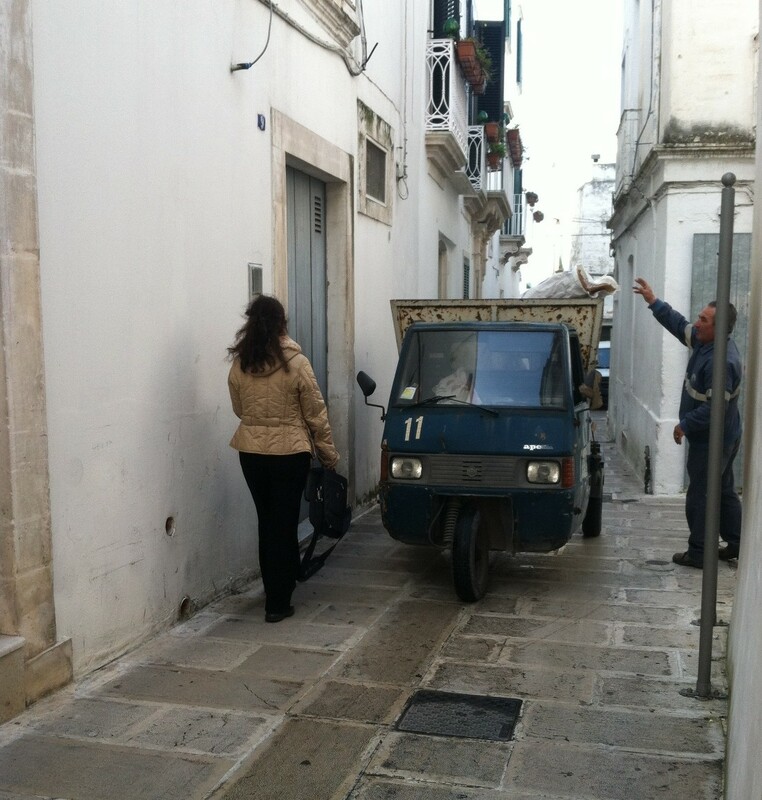 I stayed that night in Martina Franca only eight miles from Locorotondo, where I had stayed three days earlier. 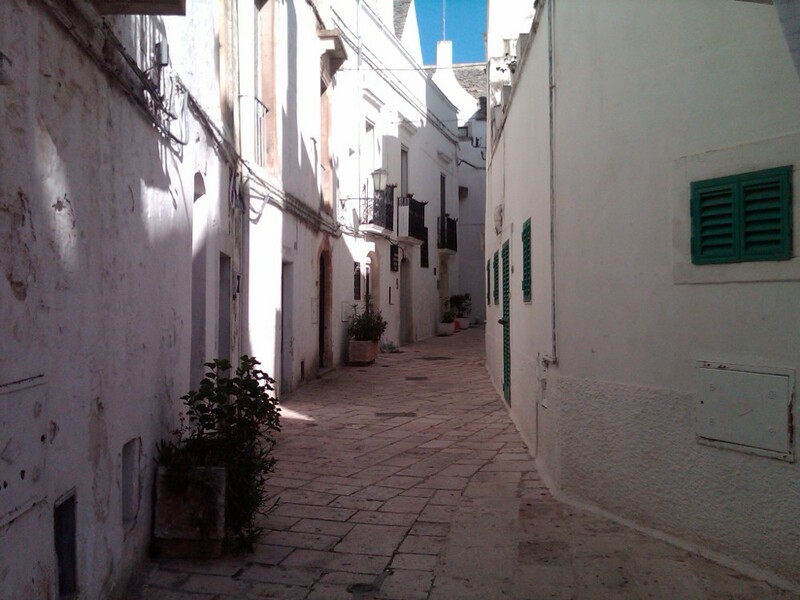 It has a similar all-white Centro Storico. Even nicer, if that is possible. Dinner that night was really great. Sausage, which Martina Franca is famous for. There is a big Opera festival each summer in Martina Franca. I met a guy at the restaurant who lives in Venice and teaches voice, and was visting Martina Franca for lessons. 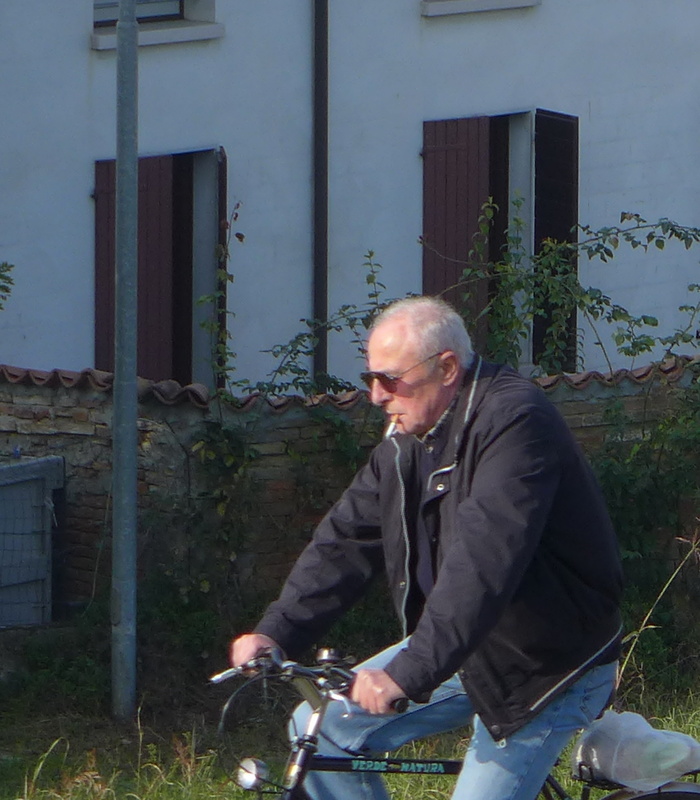 I could not figure out his accent, it turns out, although he did NOT want to admit it, but he was American who has lived in Italy for thirty years. My ride the next day was back towards Bari. When thinking of travelling Europe, I usually try to stay away from the beaches, because many Italian and Spanish beach towns look like a bad version of Florida, populated by Brits. 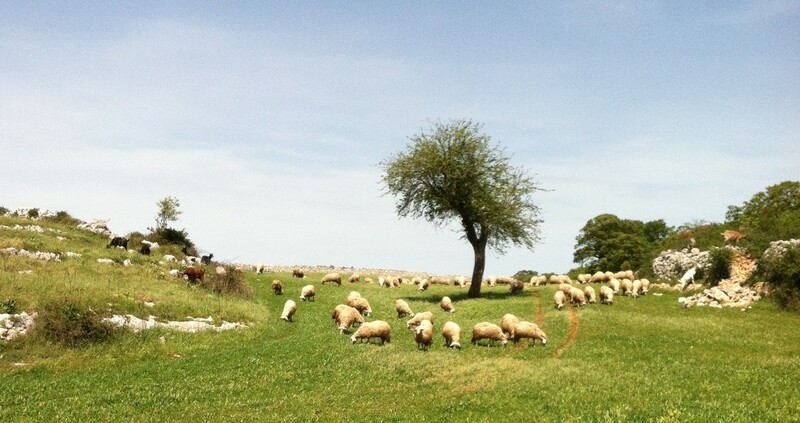 But this day, riding high in the hills of Valle D’itria, going to the beach was a treat. 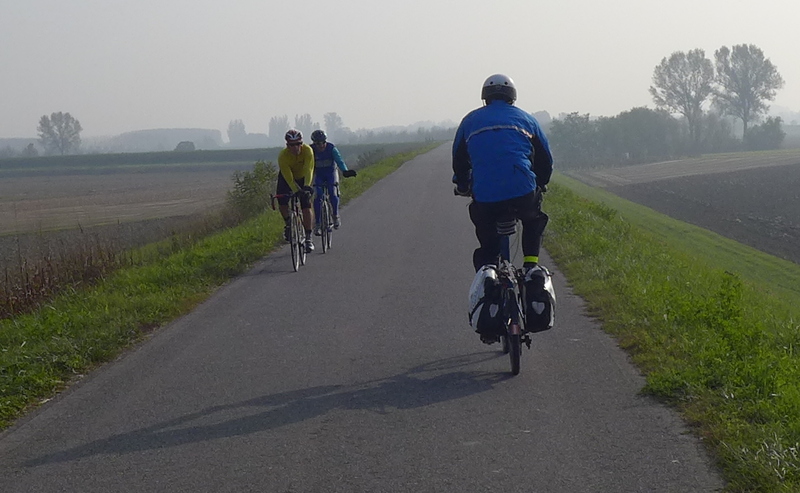 The final day of riding was a day-long trip, twenty something miles each way to the old coast city of Trani, and back. 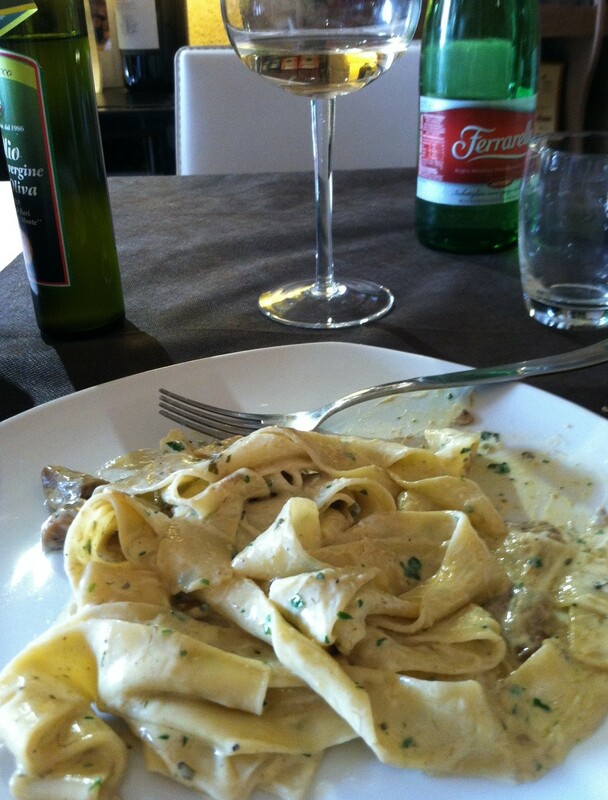 Lunch in Trani was at the fanciest place I had eaten on the entire trip. Delicious, of course. 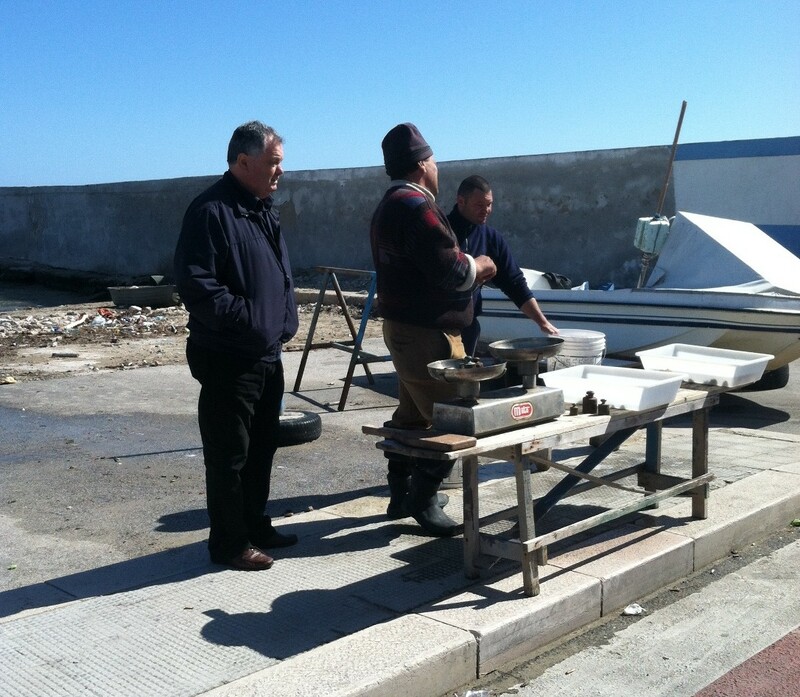 But even this place was only thirty-five Euro, tax and tip included. Most of the meals on this trip were about twenty. 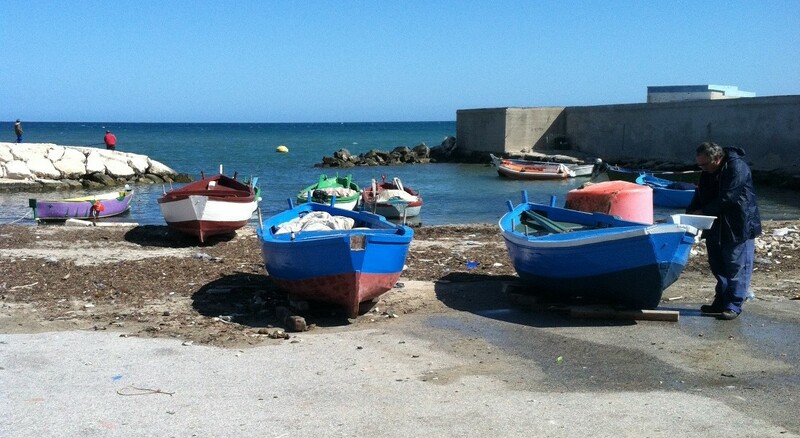 On the way back I saw several groups of boats and fishermen. They actually did sell squid by the pound, straight off the boat. This was before I had to fight the traffic and suburban sprawl of getting back to Bari, so I could shower and get my bike into the suitcase, for the evening flight to London.